Why do you think Atlanta chose murals as a way to highlight the city's civil rights legacy? Why do you think city leaders timed the murals' premier with the Super Bowl? Why do you think the artists who painted Atlanta's murals attended "community conversations" to get ideas for their designs instead of just basing their artwork on what they already knew about the Civil Rights Movement? 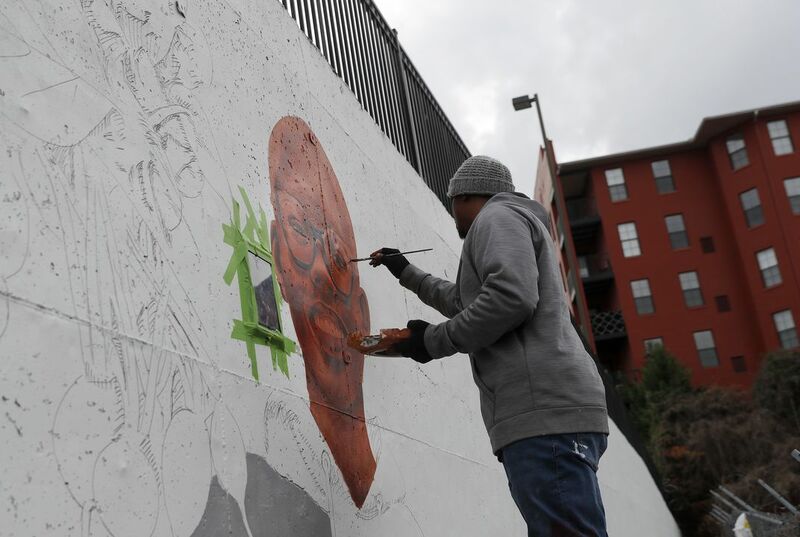 In the article, Muhammad Yungai, the Atlanta-area artist chosen for the mural project said, "I believe education is the biggest thing that we can do as a culture to ensure that everyone can achieve the life they want." Do you agree with him? Why or why not? And how is this opinion connected to civil rights? According to the article, the term "beloved community" was made popular by the Rev. Martin Luther King Jr. It describes a society centered on equal opportunity and justice and rooted in the philosophy of nonviolence. Do you think modern society is moving closer to or further away from being a "beloved community?" Why? In this National Museum of American History activity, students pretend to be an American living in 1963 who decides whether or not to join the March on Washington. Students base their choice on information gathered through guided observation from a handbill from the march. This online issue of From Art to Zoo, provided by the Smithsonian Center for Learning and Digital Access, and originally published in 1987, the bicentennial of the U.S. Constitution, helps students and teachers bridge the seeming gaps between the document and their own world. This National Portrait Gallery online exhibit documents the struggle for rights including civil rights, labor rights, women’s rights, American Indian rights, disabled rights and gay/lesbian rights. The exhibit highlights important figures in each movement and includes lesson plans for students in grades 7-12 along with video clips that guide visitors through the exhibition. In this teacher-created lesson from the Cooper-Hewitt, Smithsonian Design Museum, students use the design process to identify civil issues at their school (rights, responsibilities) and to propose solutions to problems. The object-based lessons on this National Museum of American History site examine the Greensboro Woolworth’s lunch counter and its importance to the Civil Rights Movement. The site includes an introduction to teaching history with objects, three lesson plans focused on segregation and the Civil Rights Movement and annotated links. This National Museum of American History site, which focuses on the experiences of Japanese Americans who were placed in detention camps during World War II, explores a period of U.S. history when racial prejudice and fear upset the delicate balance between the right of a citizen versus the power of the state. Students will experience the story through interactive galleries that combine images, music, text and first-person accounts. In these lessons from the Center for Folklife and Cultural Heritage, high school choral students take part in musical activities while learning the history of South African “freedom songs.” They look at correlations, both musical and historical, to the African American Civil Rights Movement.